Weston’s Jack Blyzinskyj is on his way to victory in the 100 backstroke during the Division 2 state meet at Harvard. Blyzinskyj also won the 50 free in a state record time of 20.50. Wright earned a pair of Division 1 state titles this year, capturing the top spot in the 50 free in 21.68 and the 200 free in 1:40.39. He is a year-round swimmer and avid sailor. An honor student, he hopes to study government in college. Blyzinsky left quite a mark at Weston, with 12 school records and All-American recognition. He helped Weston capture the Division 2 state title while earning individual honors in the 50 free (a state record 20.50), 100 back (49.68), and the 200 and 400 relays. He will attend Florida. Bradley graduates holding six state titles in four different events over a career in which he was never beaten. This winter he won the 200 IM and 500 free titles at the Division 2 meet. He was also the Hockomock MVP. He will attend Notre Dame. Burrow helped Weston capture its second straight state title while turning in a first-place finish in the 100 butterfly (52.00) and a second place in the 200 IM (1:57.44). A DCL All-Star he also helped capture two relay championships in the 200 and 400 Free. Connors finished off a spectacular sophomore season by winning the Division 2 state title with a 456 dive total. He finished 15th as a freshman. This winter he was undefeated in Bay State Conference competition. The honor roll student also plays varsity soccer. The Merrimack Valley Conference co-MVP, Finn earned the top spot in the 100 backstroke (51.71) at the Division 1 state meet as well as second in the 50 free (21.72). The National Honor Society student also competes for the New Wave swim club. The 6-foot-2-inch 175-pound junior earned Eastern Independent League Swimmer of the Year honors this season for the Bulldogs. 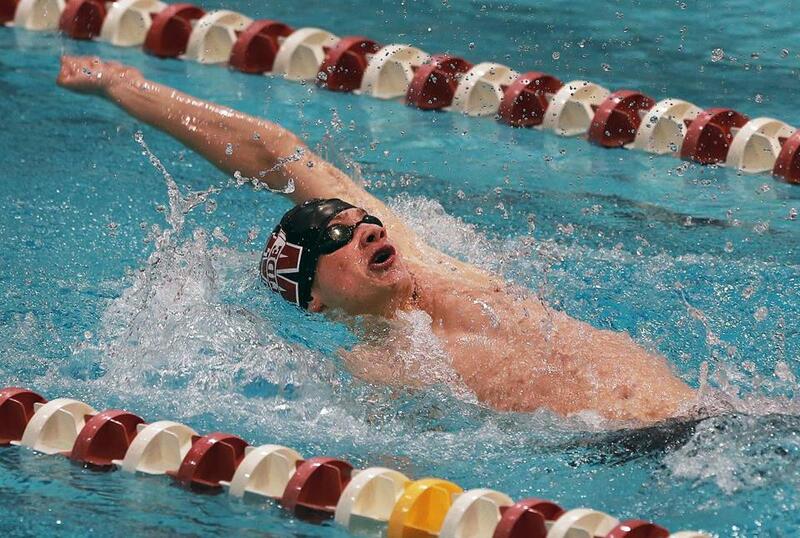 He finished first in the 50 and 100-yard freestyle events at the EIL championships and the NEPSAC Division 2 finals. Horne also plays lacrosse. Karlson qualified for states in seven different events, but captured first place in the 100 breaststroke at the Division 2 state meet, and was also part of the 200 medley relay champions. A high honor student and team captain, he will attend Brown. King spent all winter going the distance, capturing the MVC and Division 1 state titles in the 500 freestyle (4:42). An MVC All-Conference swimmer, he holds the school record in the 400 free relay and 500 free. King is a member of the National Honor Society. The captain of the Red Raiders and co-MVP of the Merrimack Valley Conference, Kitchen was Division 1 state champ in the 200 IM, clocking in at 1:58.01. He was also a top performer in the 100 breaststroke with a season-best time of 59.08. In only his second year of diving, Malatesta turned in a score of 576 to clinch the top spot at the state meet and help Prep earn its eighth straight Division 1 state title. He is also a member of the National Honor Society. Peacher racked up a host of state titles this year starting with the Division 2 team title for Weston. He also won the 100 free (47.16) and 200 free (1:43.09) crowns, and helped set a record in the 200 free relay. He will attend the Naval Academy. A four-time MVC diving champion, Pires finished second at the Division 1 state meet after winning the title a year ago. He was undefeated in dual meets this season. A team captain and member of Zap Diving, he will attend Fairfield. Swaim helped lead the Eagles to an eighth straight Division 1 state title, capturing top honors in the 200 medley relay and the 200 free relay. Individually he won the 100 fly in 51.89, setting a school record in the process, and finished second in the 100 back. A three-time Merrimack Valley All-Conference swimmer and this eason a co-MVP, Zhao was the MVC’s top performer in the 100 and 200 free. But his best accomplishment came as he earned top honors in the 100 free at the Division 1 state meet in 48.01. Just looking at the splits of the Division 1 state meet race tells you why they were champs. All four swam the fastest split of their respective leg to help Weston cruise to a six-second victory, finishing in 1:26.39. That time was good for a meet record that had been held by Weston and stood for 12 years. Peacher, an individual All-Scholastic opened with a 21.64, followed by Sam Cekala’s 22.51 in the second leg. Ryan Burrow finshed the third leg in 22.11. Byzinskyj was the anchor and turned in the fastest split of anyone in the race with a 20.13. The Eagles cruised in the first event of the Division 1 state swim meet this year, capturing the 200 medley relay title in 1:36 flat, more than five seconds ahead of second place. It was a good start for the squad en route to its eighth straight state title. Alex Swaim opened the first leg in a blistering 23.66 opening a nearly three second lead. Kent Parsons maintained the lead swimming the second fastest second leg in 27.13. Joe Turk held strong in the third leg, finsihing in 24 seconds even. Jennings Soccorso-McCoy swam the anchor and turned in the fastest fourth split, in 21.21 to clinch the title. The exclamation point on Weston’s state championship triumph in the Division 2 state meet came in the final event. Once again the Weston swimmers swam the four fastest splits en route to a seven-second victory in 3:09.42. Jack Blyzinski opened with a 45.89 to get out to an early lead. Ian DeLaney followed with a 48.72 leg almost a full second faster than anyone else. Burrow maintained things in the third leg with a 48.22 split setting the stage for the anchor. Tommy Peacher, an individual All-Scholastic put the finishing touches on the race, and the meet closing things out with a 46.59. Pacheco helped Apponequet capture its first ever Southern Conference regular-season title, going 8-1 in dual meets, as well as winning the conference meet. A New Bedford High (1992) and UMass-Dartmouth graduate, he’s a two-time EMISCA Coach of the Year. Bay Colony — Barnstable: Alex Damiecki, Jonathan Dray, James Stergis-Cox. Bridgewater-Raynham: Kyle Kennedy, Tim Souza, Zach Souza. Coyle & Cassidy: Matt Houghton. Nantucket: Taylor Aguiar, Henry Blackwell, Jack Decker, Miles Geddes, Tavio Goncalves, Tyler Wheeler. Nauset: Jake Avery, Emmett Draz. Sacred Heart: Tom Griffin. Sandwich: Brian Cundiff, Brian Hann, Alex Simpson. Taunton: Dylan Schrama. Bay State — Brookline: J.D. Nurme, Franklin Yeo. Framingham: Nate Courville, Josh Jacobson, Tim Long, Hunter Olson, Matt Peck, Kevin Silva. Needham: Cassidy Bastianelli, Bowen He, Thomas Lively, Lucas Radouch, Brendan Timmerman, llie Tomac, Austen Young. Wellesley: Jonathan Chow, Brendan Connors, Andrew Gartley. Catholic Conference — BC High: Mark Mueller. St. John’s Prep: Robert Barry, Jake Bennet, Philip Dtytko, Justin Farmer, Andrew Gillie, Alex Glidden, Samual Hodgeman, Sean Janko, Cole Malatesta, Kent Parsons, Jennings Soccorso-McCoy, Alex Swaim, Conner Sweeney, Joe Turk. St. John’s (Shrewsbury): Jack Dallmeyer, Peter DelMastro, Millard Lawson, Jason Niness, Richie Smith, Alexander Sullivan. Dual County — Acton-Boxborough: John Bellitti, Eric Feirouz, Matt Phillips. Bedford: Jason Vafiades. Concord-Carlisle: Oliver Ward. Lincoln-Sudbury: Ricky Billig, Taylor Brown, Tom Edwards, Chris Wilkins. Newton South: Ben Eisenberg, Ryan Spatz. Wayland: Alex Chused, Matt Cramer, Doug Curtin, Mark Karlson, Charlie Nuss. Westford: Tim Edison, Zach Ketterine. Weston: Jack Blyzinskyj, Ryan Burrow, Sam Cekala, Austin Chritchlow, Ian DeLaney, Jamie Packs, Tommy Peacher, Dan Spellman. Hockomock — Attleboro: Owen Wright. Foxborough: Tim Smith. King Philip: Michael Choate, Alex DiGiacomo, Chris DiGiacomo, Luke Sprague, Matt Vieira, Gordon Winget. Mansfield: Austin McGowan, Matt Nugent. North Attleborough: Ryan Boraski, Jonny Cummings, Ben Hargrave, Drew Wentworth. Oliver Ames: Brad Cole. Sharon: Nickie Cheung, Eoghan Daly, Jon Dunlap, Jack Fergenbaum. Stoughton: Hunter Goodrich. Merrimack Valley — Andover: Vince Camin, Eric Shi, Aaron Wu, Eric Zhao. Central Catholic: David Kitchen, Daniel Lefebvre, Will Pannos. Chelmsford: Chris Daneili, Andrew Majeski, Daniel Pires, Sean Regan. Haverhill: Matt Amedeo. Lowell: Erik Finn, Kevin King. Middlesex — Belmont: Ben Johnson, Andrew Kelley, Joe Tocci, Thomas Zembowicz. Burlington: Ben Aulenback, John DiRusso. Lexington: Bruce Bowie, Dave Ikezu, Kenny Lamm, Ben Mock, Victor Porras, Chris Smith. Melrose: Andrey Davidhovich, Jack Steinberg. Reading: Jerard Fredette, Scott McGinty, Will Melley, John Odonnell, Nick Rainville, Nic Stevens, Conner Traugot. Winchester: Josh DiNardo, Dale Gable, Justin Kwan, Christian MacDonald, Brian Reid. Southern — Apponequet: Josh Beck, Alex Gallant, Ben Littefield, Alexander Turner, Devon Turner. Bishop Feehan: Grant Casey, Matt Kenney, Liam McLaughlin, Randy Melanson, Jackson Perry, Chad Schreiber. Bishop Stang: Lorenzo Dube, Jon Mariner, Max Medina, Lenny Murphy, Eric Pauls, Jameson Rose. Brockton: Antonio Monteiro. Durfee: Bobb Asprinio, Nolan Burns, Daniel Chea, John Cipollini, Andrew Nadeau, Hunter Reis. Milford: Kevin Bradley, John Fitzgerald, Nolan Hobart, Michael Mason. New Bedford: Nathan Bates, Jacob Benoit, Eric Franco, Zachary Sousa, Brianner Vieira. Seekonk: Mike Maxwell. Westwood: Chris Gilman, Justin Hui. Tri-Valley — Holliston: Liam Doyle, Neel Sekar. Hopkinton: Andrew Devine, Reece Donahue, Brian Doyle, Spencer Franklin, Chris Kimura, Andrew Madigan, John Nadeau, Josh Perez. Medfield: Alex Carpino, Alec Haley, Connor Haley, Andrew Maritan. Norton: Eliot Ariola, Paul Karcis.